Let your heartfelt prayers reach your loved ones on Raksha Bandhan through this Holy Puja Aarti Thali with Kaju Katli and Rakhi complemented with a free Rakhi, Roli Tilak and Chawal. This delightful Hamper is composed of Silver Plated Paan shaped Puja Aarti Thali followed by 100 gm. Kaju Katli and Bhaiya Bhabhi Rakhi with 1 Kids Rakhi. A minor variation in design may take place. Silver Plated Paan Shaped Puja Aarti Thali with 100 Gms. (Gross Weight) Kaju Katli and Bhaiya Bhabhi Rakhi with 1 Kids Rakhi and Free Roli Tilak, Chawal. Silver Plated Paan Shaped Puja Aarti Thali with 250 Gms. (Gross Weight) Kaju Katli and Bhaiya Bhabhi Rakhi with 2 Kids Rakhi and Free Roli Tilak, Chawal. Silver Plated Paan Shaped Puja Aarti Thali with 500 Gms. (Gross Weight) Kaju Katli and Bhaiya Bhabhi Rakhi with 3 Kids Rakhi and Free Roli Tilak, Chawal. 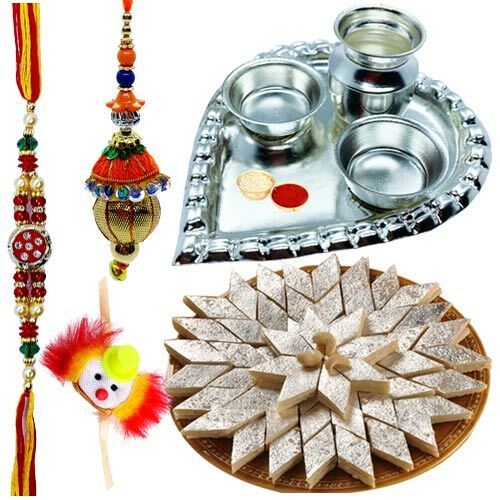 Silver Plated Paan Shaped Puja Aarti Thali with 1 kg (Gross Weight) Kaju Katli and Bhaiya Bhabhi Rakhi with 4 Kids Rakhi and Free Roli Tilak, Chawal.